Persistence is the ability to save files and content to disk, so that you can read it out later and be able to save stuff. Most apps use persistence of some sort; even if your app doesn’t create files, you may still have settings and configurations you want to save. iOS provides a number of formats to save different types of data. These include user defaults, property lists (plist), archived objects, text files, XML, SQL databases, and Core Data. In this post, we’ll talk about the first four formats. XML will be covered in a separate extension, as it uses additional software beyond the standard SDK, and Core Data is complex enough to be the subject of its own post. With the power and flexibility that Core Data provides, there is little need for standard SQL databases, and so we will not cover it here; there are many good tutorials on SQL on the Internet. Let’s get started. 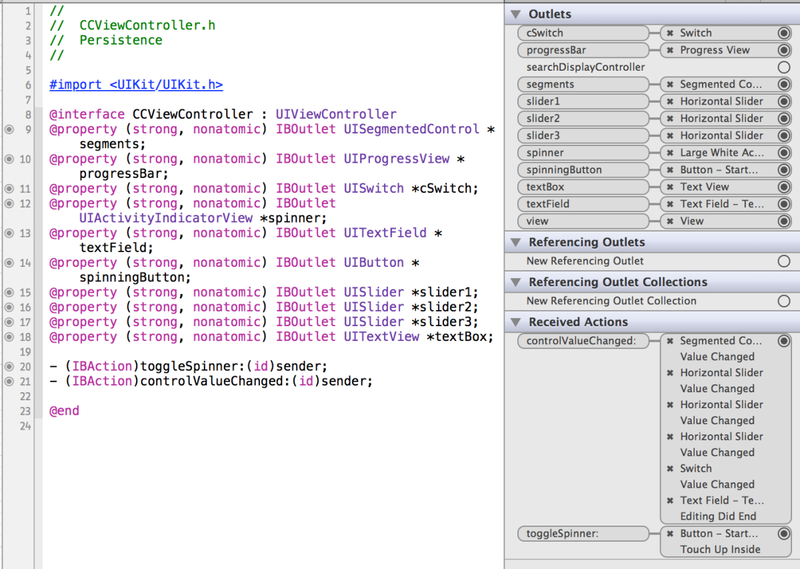 Open Xcode, create a new Single View Application, and call it “Persistence”. Make sure to not use storyboards; that’s a topic for another post. Open up the XIB file, and layout an interface like the one shown below. If you need help building the interface, check out this post, or get in touch through the comments or email. Also, make CCViewController.h the delegate of the text view. Again, if you need help, get in touch through the comments or email. You can also download the project at the end of this post. 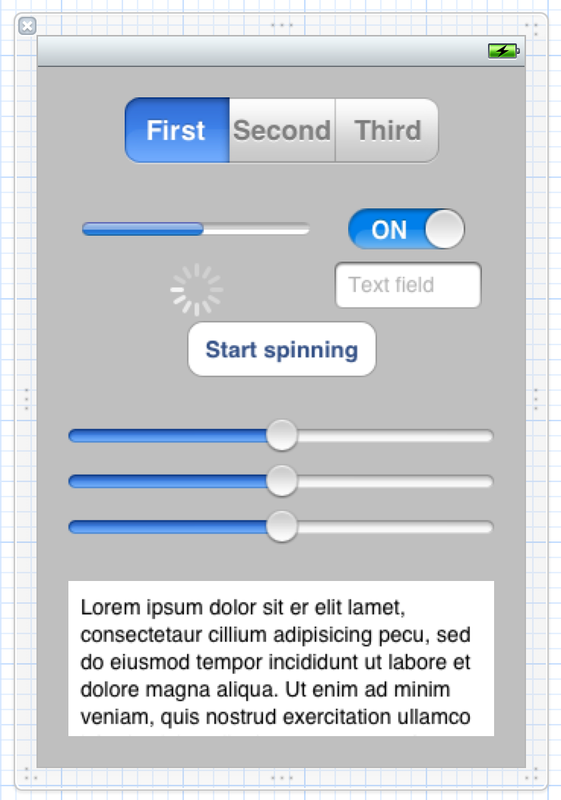 Here, we simply check to see if the spinner is spinning (animating), and toggle it the other way. We also update the button label to reflect its new action. The next method is where most of the persistence work play in. We’ll check the sender argument, and save its value to an appropriate store location. > The defaults system allows an > application to customize its behavior > to match a user’s preferences. For > example, you can allow users to > determine what units of measurement > your application displays or how often > documents are automatically saved. > Applications record such preferences > by assigning values to a set of > parameters in a user’s defaults > database. The parameters are referred > to as defaults since they’re commonly > used to determine an application’s > default state at startup or the way it > acts by default. To remove a value by key, use -removeObjectForKey:. Plists have been a standard way to store text and settings since the early days of Cocoa. Plist data can be either in XML or binary format, and it is possible to convert between the two formats. Although there are arguably better alternatives, plists are still a standard way of saving data in iOS and is baked into a number of Foundation classes for easy access. In this case, we’ll create a key-value dictionary and save its contents to a plist. This is the basic way of saving configuration information to plist. Before we begin, let’s look at an example plist. You can find a number of them ~/Library/Preferences. The plist appears to be in an XML format, but if you open the file in a text editor, you see the incomprehensible binary nature of the file. In our case, we’ll let NSDictionary handle the data transfer. 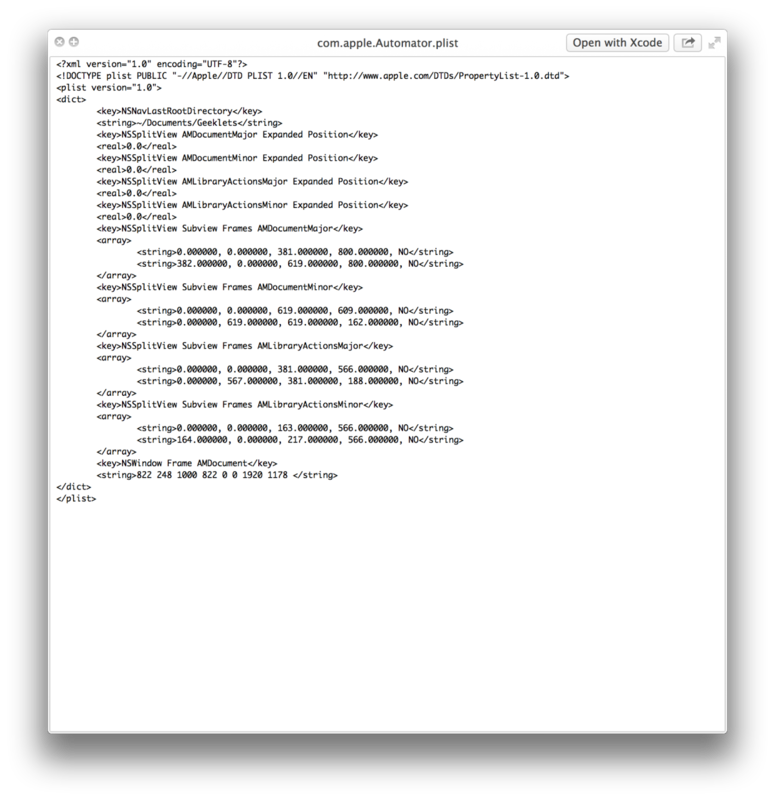 NSDictionary has a -writeToFile:atomically: method, which writes a “property list representation of the contents of the dictionary to a given path.” You can re-create the dictionary from the file using the initWithContentsOfFile: method. Only certain object types can be written to plists. These include instances of NSData, NSDate, NSNumber, NSString, NSArray, and NSDictionary. -writeToFile:atomically: will check of all objects in the dictionary are of these types; if not, the method will return NO and the file will not be written. Finally, we’ll save the dictionary at the end of controlValueChanged:. We get the documents directory, and create a file path by appending the filename to the directory string. We pass it into the NSDictionary method, and tell it to write to the file atomically (writing to a temp file then renaming it to prevent data damage during the writing process—you either have the old version or the new, but nothing corrupt, in-between). The archiver object is created with an instance of NSMutableData, and when the archive process is finished the data object contains a binary representation of the original object. This data can then be saved out to a path. Archiving objects is a really easy way to save relatively complex data objects to a file. 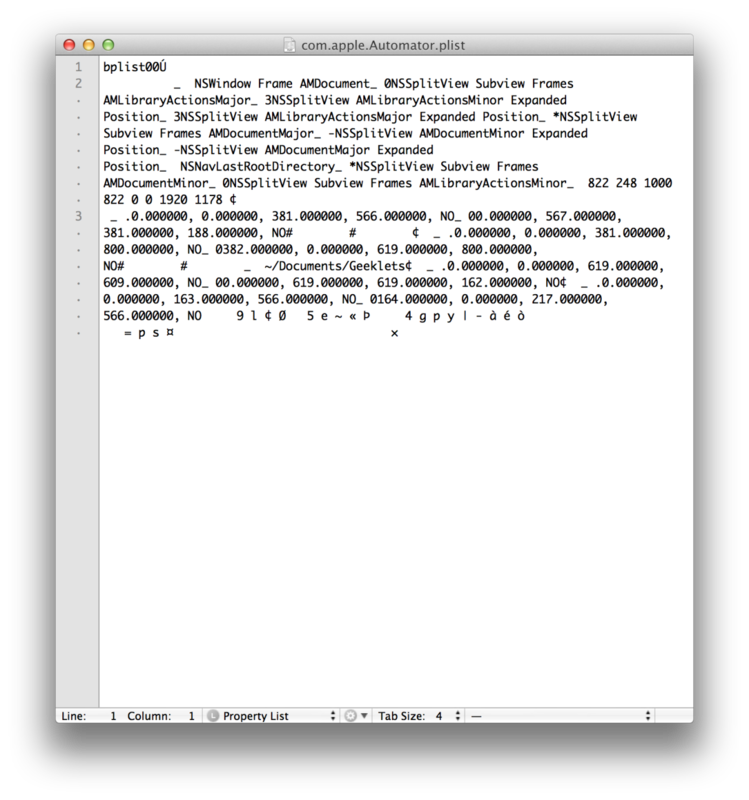 However, the data is written in a binary format, and as such can only be used on OS X and iOS. Also note that a number of other classes, including NSArray, support writing to plist, and most Foundation data classes support data encoding. The method of interest is writeToFile:atomically:encoding:error: on an instance of NSString. The first argument is a file path, the second is a boolean, the third is one of a few constants (most of the time you’ll use NSUTF8StringEncoding), and you can pass a pointer to an error if you want to know if anything went wrong. We’ll restore all the data to the controls in viewWillAppear:. The APIs are pretty straightforward. First, we read values out of NSUserDefaults to restore the selected segment. Next, we get the documents path, then load the plist array using an NSDictionary method. We then read the values in the dictionary through the key and set the proper values on our controls. We do the same thing with the sliders, except that we have NSKeyedUnarchiver decode the binary data into a dictionary. Finally, we read in a text file using an NSString method and set the text inside the UITextView to that string. That’s all there is to basic data persistence. When you quit and relaunch the app, all the settings and control values will still be there.